“After winning the race, I do feel a little sad of not allowing Fahmi not winning his home grand prix. So, I want to say sorry to Fahmi,” said Cortese at the winners’ press conference where he was flanked by Zulfahmi and third-placed winner Jonas Folger. Starting from pole position, Zulfahmi took the holeshot at Turn 1; but let Folger to pass him at the third corner; allowing the Mapfre Aspar Team Moto3 rider to lead. “It was a strategy that we have decided before the race; learning from our past experience. 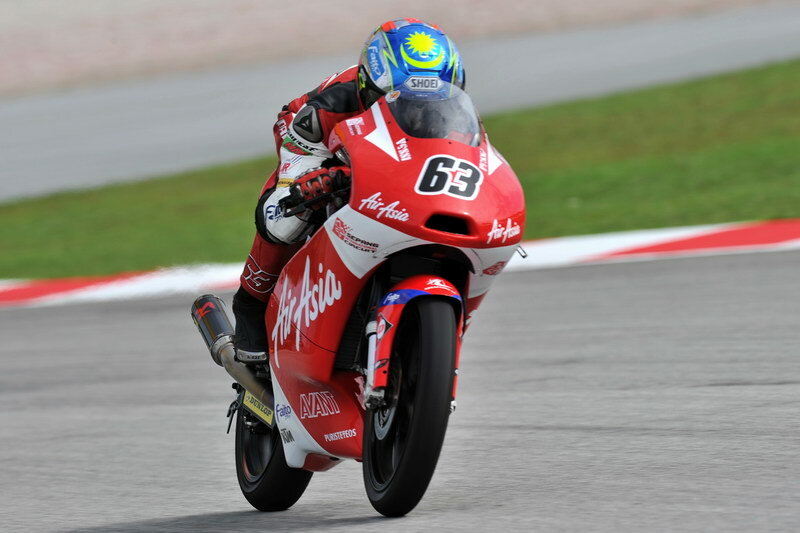 I know that my bike has straight-line speed advantage over Folger, so it was no problem to have him in front,” Zulfahmi said. With eight laps remaining, a few rain flags came out in a few corners on the track as the rain came. And that prompted Khairuddin to make his move on Folger to take the lead, much to the delight of the local crowd. “Only when I feel a few drops of rain on my visor mid-way through the race; that I decided to pass him and lead. I fear that it might suddenly rain and they might red-flagged the race. If that happens, I would want to be at the front. “But, there was just little rain and there was no need to stop the race. So I just pushed,” said Khairuddin, who occasionally was passed by Folger but was immediately overtaken back by the Malaysian rider who had the crowd sitting at the edge of their seats as he pushed his KTM machine to the limit. It was fairing to fairing with the front two as Cortese stalked the pair from behind. Luis Salom, who at one stage was among the leading group, had dropped off and was then involved in a heavy battle with Oliveira heavily for fourth. With five laps to go, Cortese was clearly not contented to stick it out and sail to his world championship, as he went past Folger into second to hunt down Khairuddin. And it was a typically breath-taking Moto3 last-lap, with Cortese passing the Malaysian in the final turn to deny him victory at his home track. “I actually made a mistake at the second last corner and that allowed Cortese to pass me. I tried to fight back at the last corner at Turn 15; but brake too late. I had a slight bump at the entry and then decided second place is better than a crash. “I am very happy to finish second. I would also like to thank the crowd. They were great all the way and I was really fired up to their cheers. I would also like to thank KTM for the bike … we have an excellent bike throughout the weekend,” added Zulfahmi. By winning the Moto3 world championship, Cortese is now the youngest-ever German to win the lightweight class, and only the fourth of his countryman to do so. It is also the first time that a MotoGP category has been won by a KTM machine. Zulfahmi’s second place earned him 20 championship points; taking his total haul to 112 but remaining in seventh position behind Danny Kent, who has 118 with two more rounds to go. Cortese leads the championship with 280 points. “Today’s achievement gives me greater confidence in in the remaining two races. I am sure that we would go equally good in Australia and Valencia,” he added.